Metrolingua: Typical plural mistake - documented! There's a restaurant near me that has a similar error. Not only that, but they make it inconsistently: sandwiches, salads, and wrap's. Augh! I've considered peeling the apostrophe off the window. I'm not sure whether its graffiti if you're fixing something so it's no longer wrong. I don't know when the whole apostrophe thing started, but it seems to have multiplied in the 21st century. 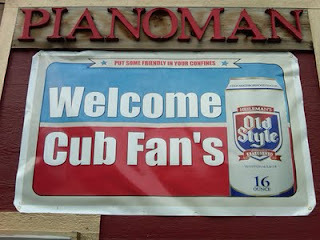 While I agree on the apostrophe misuse, they have the singular form of Cubs correctly. When a plural form is used as an adjective, the plural is typically dropped. You get the picture. So it's very natural to call the fans "Cub fans". The explanation makes sense, but the team is called the Chicago Cubs. 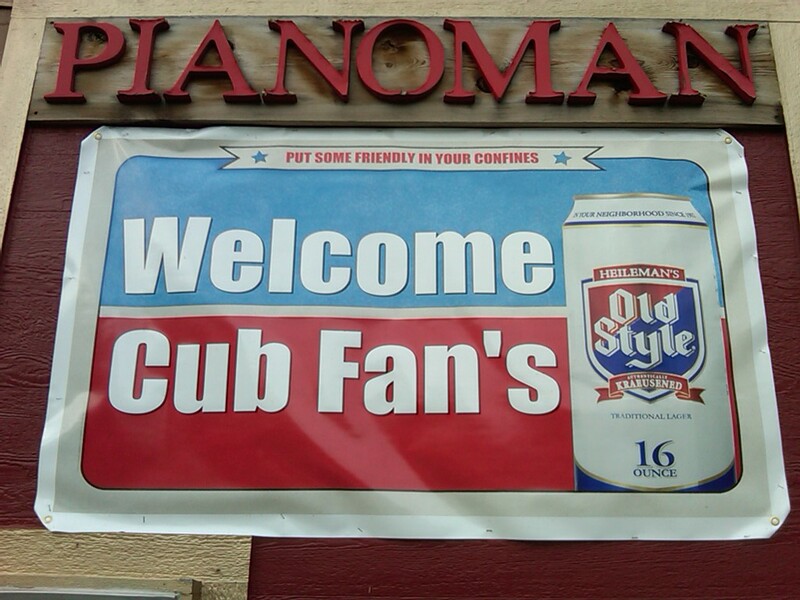 So the sign should say WELCOME CUBS FANS! Yes? And the multiplicative effect to which you are referring exists because grammar is no longer taught in public schools...at least in California and punctuation is part of grammar; well at least when I was a kid the subjects were taught together. And this is from a person who always hated grammar but boy oh boy do I wish it was still taught in our schools!!! Another reason for the effect is the growth of English as second language learners. Their 'oral aesthetic' is far different from a native English speaker so they are prone to make specific errors. With many Asian students the plurals are confused, Mexican students tend to confuse much with more and Black students tend to say ax instead of ask et cetera et cetera et cetera. What's ironic is that ESL requires grammatical knowledge, but they're not teaching it in schools as much to native speakers. People need to know the rules in order to break them, but then again, English often doesn't have consistent rules (as is discussed in Bill Bryson's The Mother Tongue).